Generally there are numerous reasons why sport clubs are interested in selling tickets and thus in high attendance figures. The purpose of this short treatise is to identify the three main and probably most important generic reasons why a sufficient live attendance is crucial for every sports club. The first reason goes back to the fact that ticketing is one major source of direct revenues for most professional sport clubs (Chadwick & Beech 2007: 5; Howard & Crompton 2004: 87; Clowes & Clements 2003). 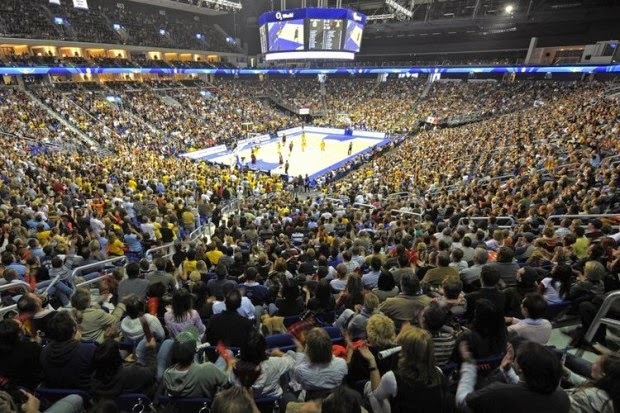 During the season 2012/13 the participating clubs of the Beko BBL generated a total revenue of 86,6€ million. The second biggest amount of 19,8€ million (17,15%) was generated through ticket sales (Deloitte 2013: 9). Only the revenues from sponsorships reached a higher value for the clubs. In addition spectators are responsible for associated revenues through for instance merchandise purchases (Howard & Crompton 2004: 88). The mentioned revenue figure underpins the importance of ticket sales for professional sport clubs out of the financial perspective. The specific service characteristic of perishability reinforces this perception additionally. Related to this, Burton (1998) stresses the importance of avoiding unsold seats wherever possible because unsold tickets lose their value during the event and equal therefore lost potential revenues (Palmer 2008: 460). The fact that in case of most sports clubs the amount of sold tickets does not significantly influence the variable costs of hosting a home games even supports this perceptions. The second reason why sport clubs are interested in selling tickets is based on the impact a large and engaged attendance has upon the on-pitch processes. This effect is discussed in profound literature, mainly referring to the work of Courneya & Carron (1991) who introduced the term ‘home advantage’ in order to describe how home teams benefit from the support of their fans. Comprehensive research around this term identified the impact the crowd has upon the officials (i.e. referees and judges) (Nevill et al. 2002; Dohmen 2008; Agnew & Carron 1994) as well as upon the players (Thirer & Rampey 1997). Basically it could be summarised that “teams perform better and win more games when they receive more enthusiastic crowd support” (Zeller & Jurkovac 1988: 20). This effect was ascertained in several North American team sport leagues, including Baseball (Adams & Kupper 1994), Ice Hockey (Agnew & Carron 1994), Basketball (Varca 1980) and American Football (Nevill et al. 1996). The third reason why sport clubs are interested in ticketing is directly related to the marketing tool of sport sponsorships. Nowadays an increasing number of enterprises use sport sponsorships as a communication tool and an alternative to traditional advertising measures (Schwarz & Hunter 2008: 244; Lagae 2005: 43). Common criterions, when it comes to evaluating potential sponsees, are spectator figures, whereby there is a distinction between direct spectators, which are actually at the ground, and indirect spectators, which follow the event live or time-displaced through the media (Mullin et al. 2007: 318-324; Blakey 2011: 114/115). Whereas there is a lot research about sponsoring major sport events and sport clubs with a comprehensive media coverage (Amis et al. 1999; Quester & Farrelly 1998), only a few considerations have been made about the objectives pursued by companies engaged in sponsorships with clubs and events with a negligible media interest (Greenhalgh & Greenwell 2013). However, Greenhalgh & Greenwell (2013) argue that some particular sponsorship objectives, like for instance involvement within a community and enhancement of employee relations, could be also or even more effective pursued through engaging in partnerships with clubs having this marginal media interest. Additionally Stotlar (2009) writes that these clubs often attract more demographic and especially psychographic homogeneous fans, what could be again expedient for sponsors with corresponding objectives. As stated before were sponsorship deals the most important source of revenue (52,1%) for Beko BBL clubs during the season 2012/13 (Deloitte 2013: 9). Because the media coverage of German basketball is generally meagre (Hebben 2011) (beside some particular salient clubs like the FC Bayern Munich or the Brose Baskets Bamberg) and many club did not appear on television screens more than twice the 2013/14 season, it could be assumed that sponsors are principally interested in reaching direct on-site rather than indirect media spectators. High attendance figures could be therefore beneficial when it comes to (re-) negotiating sponsorship deals. The three identified reasons underline the importance of on-site spectators for every sport club, regardless of whether with or without a high public interest and media coverage or fully professional structures. This circumstance should be considered by officials when operating areas like ticketing, customer service or fan relation. In my opinion many of nowadays clubs have a focus shifted too much onto serving and satisfying business stakeholders beside the actual fans and supporters.